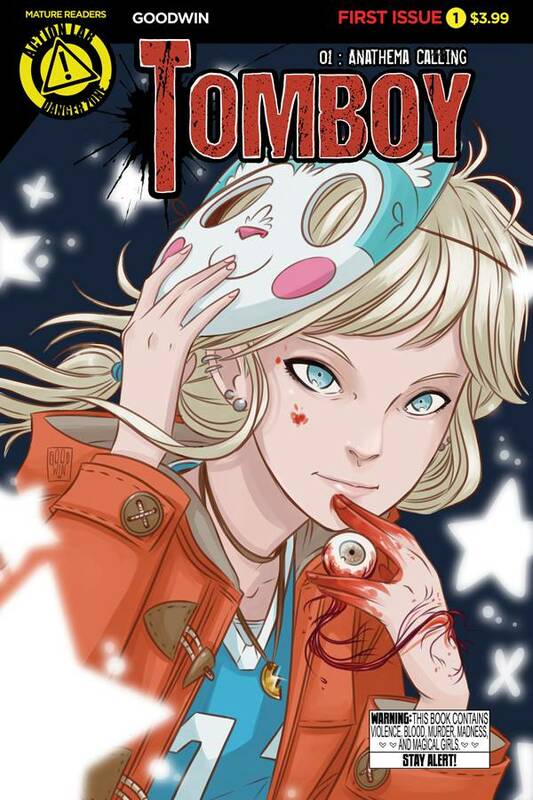 If the solicitation for Action Lab's 'Tomboy' sounds sensational that's because it is. However, when you read the first issue it reads a lot like a murder mystery with some supernatural undertones. Creator Mia Goodwin handles the script and the art for this expertly done debut with a story that builds and grows more compelling as it goes on. Goodwin establishes Addison as a smart and funny teenager who seems perfectly normal. The dialogue is natural and the characters have their own personalities that give the scenes a nice energy. The opening scene is an ominous flash forward that makes more sense by the end of the issue. There seems to be a lot of shady shenanigans going on with Trent Pharmaceutical and the lady that runs it, Irene Trent. Even though we never see her she casts a large dark cloud over the entire issue. It's hard to believe that our heroine with the loving medical examiner dad, handsome boyfriend, supportive best friend, and undying love of her childhood princess cartoon would turn into such a harbinger of vengeance but she does and that's where the book takes a dark and bloody turn. Goodwin crafts this twist with patience by building the world around Addison first with plenty of foreshadowing. By the time Addison realizes her power we're already consumed by the mystery that unfolded before. We're already hooked by the time Addison administers her brand of justice. Goodwin's artistic style is very clean with sharp lines and a lot of detail. The playful caricatures belie the increasing suspense and violence that occurs. The colors are subdued but varied and slowly turn sinister. The pace is quick but not rushed allowing for each scene to breath a little so the reader can take in the setting. There's a certain rhythm to the story that pays off in a satisfying read. 'Tomboy' is being marketed to the same audience of 'Batgirl' and 'Spider-Gwen' but it really skews towards the older young adult crowd. Goodwin and Action Lab have a hit in the making. The "warning" on the cover says it all: "This book contains violence, blood, murder, madness, and magical girls." It doesn't get any better than that.